Hestia the Greek Goddess was (with Demeter and Hera) regarded as one of the three Great Goddesses of the first Olympian generation. All offerings to the gods must be preceded by an offering to Hestia, giving rise to the phrase "Hestia comes first". According to the ancient Homeric Hymn to Hestia, she was owed the last as well as the first offering at every ceremonial assembly of Hellenes. The cultus of Hestia the Greek Goddess and her equivalents (such as Roman Vesta) clearly goes deep into pre-patriarchal times, and is one of the fundamental aspects of feminine religion which was translated, in many respects unchanged, into the early patriarchal culture, being so profound, so sacred and so linked to the well-being of both the home and the city, that extensive tampering was considered unwise. The Priestesses of Vesta, the Roman equivalent of Hestia the Greek Goddess, served in a sacred enclosure where no man – even the Emperor – was permitted to set foot, and all must be untouched by men. After thirty years of vow-bound celibacy they were permitted to marry, but few took the opportunity to leave an honored position in beautiful surroundings in order to place themselves under the authority of a man. 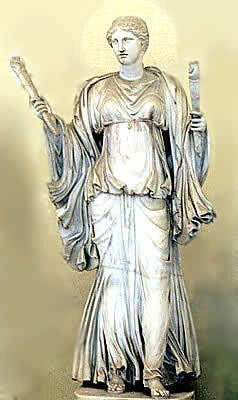 The thirty years' service of a Vestal Priestess(sacerdos vestalis), or "virgin", were divided into ten years as a student, ten in service to the Goddess and ten as a teacher, thus ensuring an unbroken disciplic succession and a tradition of feminine teaching extending directly back to pre-patriarchal times. Roman history makes clear that the Vestal Priestesses existed long before the foundation of Rome itself. What was the nature of this cultus? At the deepest level it is the religion of Hearth and Home. To modern ears this may seem a relatively insignificant concept, thanks partly to the trivialization of the hestia or home in relation to what under patriarchy became the male domain of the agora or public world. More fundamentally, it may seem insignificant owing to the trivialization of life in general. In order to understand the cultus of Hestia the Greek Goddess and universal pre-patriarchal Deity, we must remember that to the traditional mind, earthly things are the echoes of cosmic realities and that the microcosm of human life derives its profound significance from the fact that it reflects and ritually enacts the macrocosm of the Universal Whole. The Sun in the Cosmos (and this ultimately refers to the Supernal Sun, and not merely to the physical center of a particular solar system) is reflected – or better, incarnated – by the heart within the microcosm of the body and the hearth within the microcosm of the house. Thus, everything that pertains to the Supernal Sun and to the Sacred Heart of Being pertains also to the hearth-fire. And thus the cultus of the Hearth, whether conducted under the Name of Hestia the Greek Goddess or any of Her antecedent Names, is not other than the cultus of the Solar Mother. Yet again, we see that the representation of Dea as purely lunar and chthonic (earth-centered) is a result of the early patriarchal attempt to relegate the feminine to the lower symbolic elements. In truth the lunar aspect of Dea belongs to the Daughter (cf Demeter and Persephone), while the Mother, being the Supreme Deity, is always Solar and Celestial. An early form of temple is the hearth-house, with the hearth-fire serving as sacred altar. Early temples in Crete, at Dreros and Prinias, were constructed on this model, as was the central altar of the Hellenic world at Delphi, which always had its inner hestia. It should be noted that this marks this most sacred and pre-eminent Classical center as pre-Classical, since among the Classical Greeks the altar was always in the open. This is understandable in the light of the established fact that the great Delphic Temple of Apollo was originally a shrine to Dea. 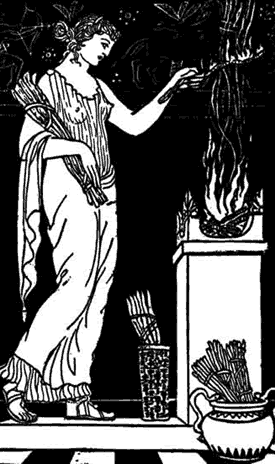 In a feminine culture every family hearth is a shrine to Hestia. Every mistress of a household was, in miniature and reflectively, a Priestess of Hestia, just as every house was an image of the Cosmos with the Sun-Hearth at its heart. It must be understood furthermore that this likeness was not "merely symbolic", it was a part of the ritual actuality of life – the vital participation of all human activity in Cosmic Reality. This participation was seen as vital to human well-being and authenticity. It is for this reason that, even in patriarchal times, the cultus of Hestia the Greek Goddess, or of Vesta the Roman Goddess, was not easily or quickly jettisoned and continued to retain many of its traditional feminine features. The concept of the home as a specifically feminine domain was also retained, although this took on a more confining characteristic particularly in view of the creation of a new domain: the agora, or public-space, which was created as a masculine preserve and which took on increasing importance as patriarchal society developed until the "political" (from Greek polis: city) came to be regarded as all-important. The very concept of the Greek open-temple could be seen as an early revolt against the sacredness of the matriarchal closed-space. Later, as churches and temples came to be regarded as part of the agora, and the idea of a "House of (male) God" was no longer perceived to be contradiction in terms, the closed place of worship was able to return to general use: now as a patriarchal institution. This concept of the city as public-space developed slowly. The original feminine concept was of the city as an extended household: the greater household of our Mother God. Even in Classical times this concept was retained to a degree. The public hearth of Hestia the Greek Goddess was still the heart of the city, and with the foundation of a new colony, a flame from this Civic Hearth was carried to the new settlement. Vesta, the Roman Goddess was even more polit-ically understood than Hestia the Greek Goddess, with the Hearth of Vesta explicitly seen as binding all Romans together in an extended family. This concept was gradually subjected to patriarchal redaction. Even though the Temple of Vesta remained a feminine sanctuary until it was closed by the Christian Emperor Theodosius in 391 A.D., the concept of the city as a great household declined in importance and the notion of the literally heart-less agora, or public-space, became dominant. Hestia the Greek Goddess, and her Roman equivalent Vesta, continued to lend a diminishing maternal aspect to the city-state, although the harsh polit-ics of patriarchy made this maternity more and more of a parody. This was necessarily the case, since a true household must have a Mistress at its Center both spiritually and politically. Devotees of Dea today rightly wish to restore the traditional sanctity to the home and to make it once more a Sacred Enclosure. The ancient wholeness of a Sacred City ruled by the Solar Dea, who burns as the hearth-fire of its inner sanctum, as well as the the hearth-fire of every private hestia, or household, is impossible within a patriarchal polity. But the household itself can – and should – still be a Temple of Hestia. And this is of primary importance once we rediscover the profound ritual and spiritual importance of the household. Polit-ics (in the sense of control of the agora) are a matter of relative unimportance. 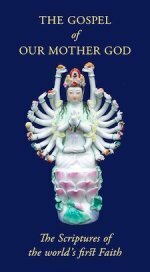 Our task is the re-creation of the feminine sanctuary, the Hestianic household, which, in this late Kali Yuga, is the only possible incarnation of the true polis or City of Dea. Whether we use the name of Hestia, the Greek Goddess or of Sai Herthe, the Déanic Name, She is the one Supernal Sun who is the burning heart in each of us and the burning Hearth at the center of our sacred home. The Day of Sai Herthe – the modern feast day of Hestia and the home.